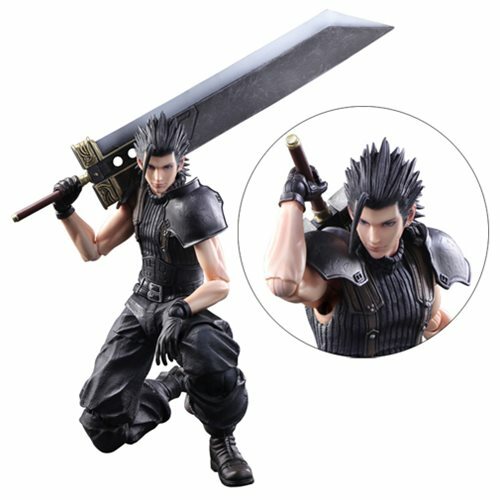 Crisis Core: Final Fantasy VII depicted protagonist Zack's growth as a member of Soldier and the inner demons he has to confront. Careful attention to details in the sculpt creates his brawny physique, iconic hairstyle, and the scar on his face. Details aren't spared from the textures on his costume to the ones on his sweater and pants. The paintwork utilizes dry brush and lowlight techniques to pursue a realism and likeness evocative of the original game. The chest piece features flexible material. This figure has a wide range of motion, and the Buster Sword can be mounted onto Zack's back, so the collector can enjoy various poses, either in action-packed battle or static standing poses. The figure measures about 10 1/2-inches tall x 3 2/5-inches wide x 2-inches long, comes with display stand, and interchangeable hand parts.